Ew, Jeremy Irons. Ew. Remember the other month when he waxed all creepy about how ladies should really just chill out and let men rub us on our bottoms whenever they feel like it? Well, now Monsieur Humbert is grappling with another social conundrum: Just what is up with gay guys!? 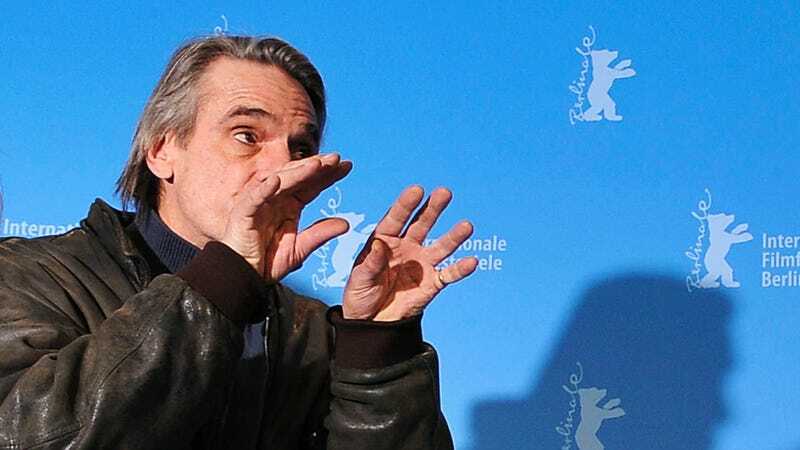 Hold on to your butts (especially you, women, where Jeremy Irons can see)—it's about to get weird. Uh, I guess Couples Therapy caught fire? The cast of the VH1 reality show "Couples Therapy" was evacuated from their house this afternoon after a fire broke out inside one of the rooms ... TMZ has learned. Law enforcement sources tell us, a 911 call was placed around 4:45pm reporting the blaze. We're told the fire department rushed to the scene, but by the time they arrived ... the crew had already extinguished the flames. Once firefighters determined the situation was all clear, they took off. No one was injured. Sources connected with the show tell us the fire was caused by a production light which had burned a couch. Madonna's dispute with Malawi's education minister continues. After changing her original plan to build a multimillion-dollar all-girls school in Malawi to instead creating 10 primary school and continuing to face obstacles, it turns out Madge didn't build any schools at all-just classrooms. "She has built classrooms at existing schools...really it's a difference in terminology," Education Minister, Eunice Kazembe, told the BBC. "They have said they have built 10 schools in Malawi and on our side, what we know is that she [Madonna] has built classrooms. These are not schools from our side and really that's the essence of the difference between her side and the Malawi government," Kazembe added. ..."She promised an academy and we agreed on standards but she just changed her mind on the project without consulting us," Kazembe said. "We'd like them to work with us so that they can be absorbed into the strategy of Malawi's education and that goes not just for Madonna-any group that comes to Malawi to assist us in education." Daddy Yankee's manager responded to allegations that the artist had come out as gay. "Once again social networks are the protagonists in spreading false news, which have been replicated by other media involving a public figure. The story that is circulating about Daddy Yankee's homosexuality declaration is a false story written by an Internet portal as many others, dedicated to fabricate and disseminate news through social networks," said Helga García, president of Perfect Partners Public Relations.